Concerns over global climate change have never been higher — and with good reason. 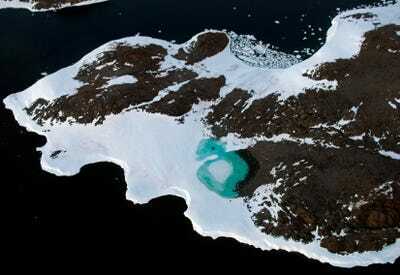 For decades, scientists have been watching warming-related trends on Earth. Increases in fires, floods, droughts, severe storms, and sea levels are just some of the consequences that researchers have observed as companions to the planet’s rising temperatures. 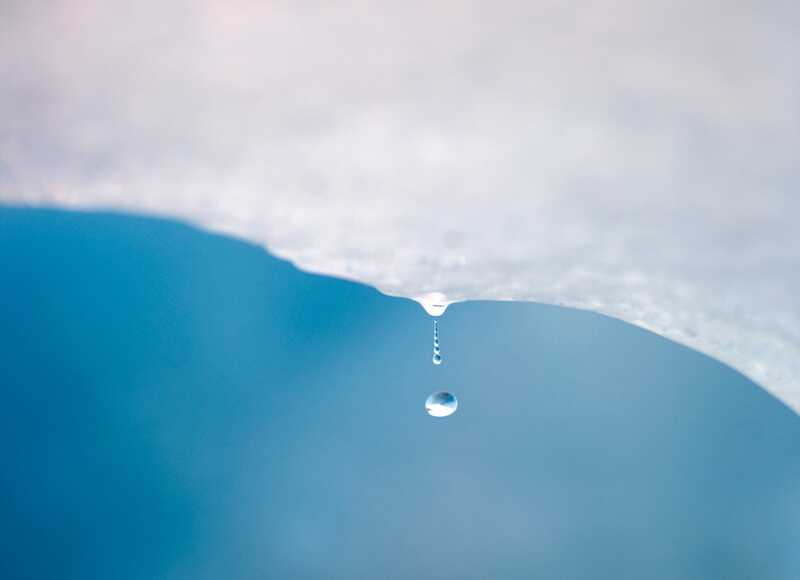 Earlier this month, the Intergovernmental Panel on Climate Change released the fourth and final instalment in its Fifth Assessment Report on Climate Change, which synthesizes and summarizes the best and most current climate science. Its projections for a future wrought with extreme weather events, famines, and extinctions is a grim look at what’s ahead if humans don’t implementing better climate policies immediately — but the report also acknowledges that many of these consequences are already occurring around the world. We’ve put together a set of photos that show stark examples of climate effects occurring all over the planet. No individual event can be taken for proof of climate change — but collectively, along with the millions of other climate-related events scientists have kept track of over the years, they illustrate a frightening pattern and point to an even more concerning future. For many people, the first thing that springs to mind when they hear the phrase 'global warming' is melting polar ice, like the melted snow forming this turquoise lake on Antarctica's Budd Coast. 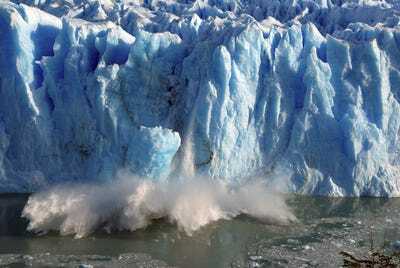 Glaciers around the world are losing ice at unprecedented rates thanks to rising global temperatures. Here, the Perito Moreno glacier in Argentina experiences an unexpected rupture. Melting ice is a major problem because of its contribution to sea level rise, but it also affects wildlife in all kinds of ways. 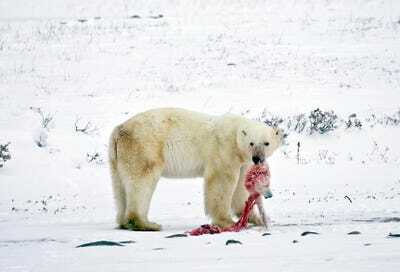 Polar bears are the poster child for changing conditions in the Arctic. As their frozen hunting grounds melt away, some polar bears -- like this one -- are turning to cannibalism and eating their own cubs. But many climate change effects are less obvious. 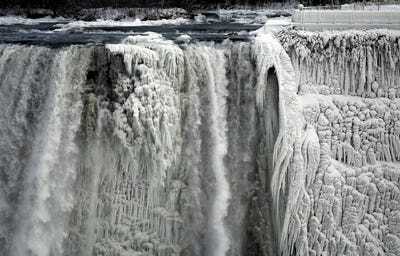 Last winter, for instance, the swirling air above the Arctic, known as the 'polar vortex,' became unstable and sent unusually icy weather streaming through Canada and the United States, causing scenes like this one at Niagara Falls. 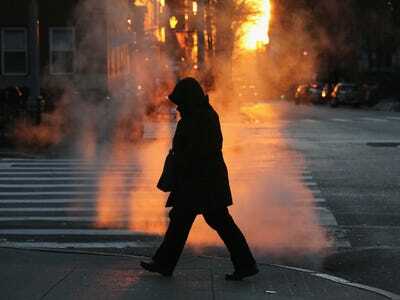 Some experts believe climate-related changes in the Arctic, like melting sea ice, can disrupt the polar vortex's stability. Other warming-related events are less subtle. 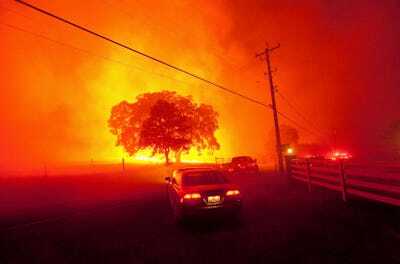 Climate scientists predict an increase in wildfires, like this 2013 blaze near Clayton, Calif., as temperatures continue to rise. The US has seen its fair share of wildfires in recent years, and projections only call for worse outbreaks in the future. 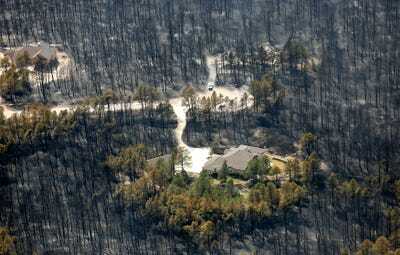 Here, a couple of isolated houses sit undamaged amongst the aftermath of the 2013 Black Forest Fire in Colorado, which destroyed hundreds of homes. Flood rates are also expected to increase, as sea levels rise and severe storms become more common. 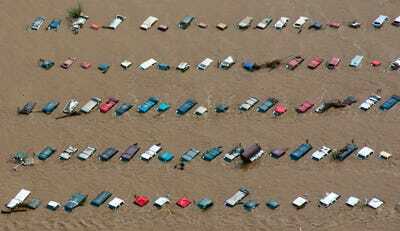 The 2013 South Platte River flood in Colorado left these vehicles submerged as it surged through the farming communities along the river's banks. And flooding isn't limited to the US, either. Here, a child sleeps in the middle of a flooded street in China's Chongqing municipality during a 2010 outbreak of torrential rain, which killed dozens of people. In 2012, floods ravaged parts of the Brazilian Amazon, while -- in a twist of fate -- droughts devastated the northeastern part of the country. 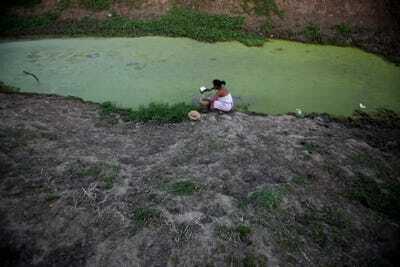 Here, a woman scoops water from a nearly dried-up well in the country's Bahia state. Rising temperatures are expected to wreak havoc on water supplies all around the world. 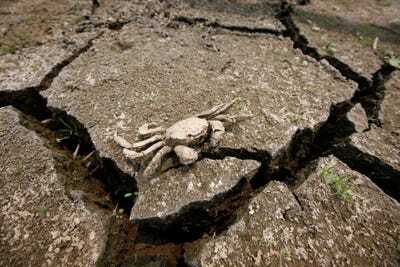 This crab carcass is sitting on a dried-up reservoir near Seoul, South Korea in the midst of a severe 2012 drought, exacerbated by uncharacteristically warm temperatures. The dried-up crab and starving polar bear aren't the only ones suffering, either. 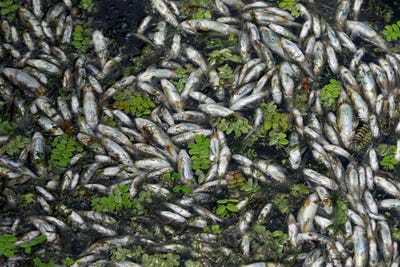 In 2012, thousands of dead fish were found floating in Nageen Lake in Srinagar, India -- killed by oxygen depletion and fluctuating water temperatures. Rising water temperatures can be a big threat to sensitive aquatic organisms. One way climate change is choking aquatic ecosystems is through algae blooms, brought on by warming waters. Algae blooms produce toxins deadly to other organisms in the water. 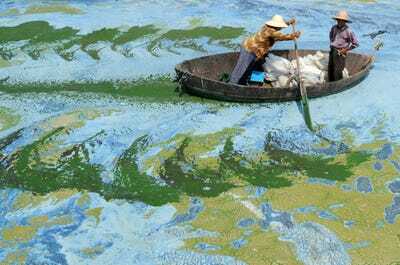 The striking colours in this image of the Chaohu Lake in China are caused by algae. Despite the already widespread consequences of climate change, nations around the world continue to pour carbon and other greenhouse gases -- the biggest drivers of climate change -- into the atmosphere. 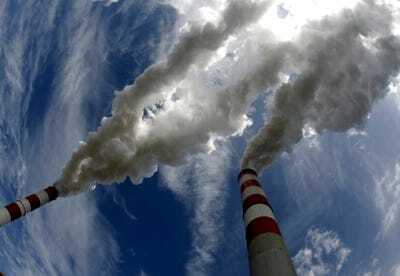 Poland's Belchatow Power Station, pictured here, is the European Union's most polluting coal-fired power station, belching 37 million metric tons of CO2 in 2013. 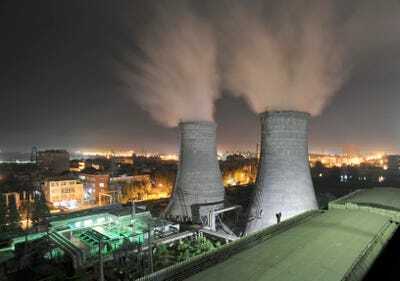 China, whose Xiangfan coal-burning power station is pictured here, recently struck a deal with US to cap its emissions by 2030, while the US will cut emissions in exchange. But more follow-through is needed from other countries around the world in order to avoid the worst effects of climate change. 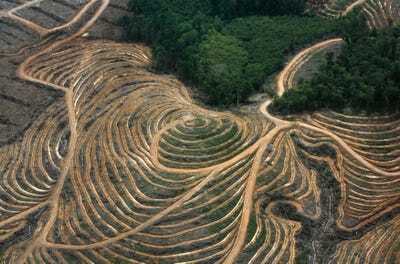 Carbon-spewing power plants are one big factor in global emissions, but deforestation, which is what's happening in this photo of Indonesia's West Kalimantan province, isn't helping either. Trees are valuable carbon reservoirs, storing up carbon that would otherwise go into the atmosphere. And burning trees just releases that stored carbon into the air. 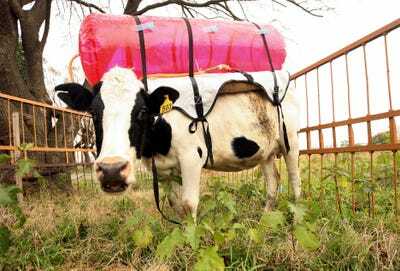 The cattle industry has also been criticised, since cows belch large amounts of methane -- a gas that traps about 20 times as much heat as CO2 -- into the atmosphere. In 2012, cows were the biggest source of methane emissions in the US. 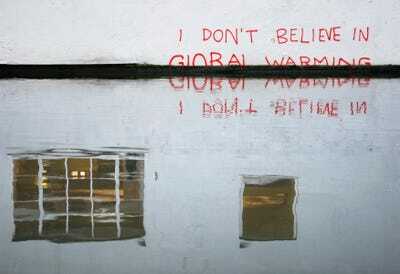 But even in the face of overwhelming evidence for human-caused climate change, climate scepticism still runs rampant. This graffiti, on a wall by London's Regent's Canal, is believed to by an ironic work of art by acclaimed street artist Banksy. But it's a relevant commentary, as climate change continues to be debated around the world, including in the US -- a definite barrier to the kinds of climate policies necessary to prevent the worst effects of global warming. Now see how climate change will specifically impact one of America's greatest cities.